They have shifted to a variety of other greens or found alternative sources of romaine, and large grocers also are making sure their romaine isn't from the affected area in Arizona. If it’s not made with romaine lettuce, is it still a Caesar salad? Some local restaurants are setting aside culinary correctness during the romaine lettuce E. coli scare, erring on the side of caution by substituting other varieties of lettuce for romaine on their menus until they are given the all-clear in a recent outbreak that has affected 16 states. Other restaurants have made sure that they’re buying only from suppliers who do not source their romaine from the lettuce fields of Yuma, Arizona, which federal health officials have linked to the outbreak. • Do not buy or eat romaine lettuce at a grocery store or restaurant unless you can confirm it is not from the Yuma, Arizona, growing region. This includes whole heads and hearts of romaine, chopped romaine, and salads and salad mixes containing romaine lettuce. • Wash and sanitize drawers or shelves in refrigerators where romaine was stored. • If you develop symptoms of an E. coli infection, talk to your doctor, write down what you ate in the week before you got sick and report your illness to the health department. “It’s just easier to switch it out,” he said. Other restaurateurs are turning to spring mix or green leaf lettuce as a substitute, or have switched suppliers to be sure their romaine is sourced locally – or at least not from Arizona. No deaths have been reported in the E. coli O157:H7 outbreak, but the U.S. Centers for Disease Control and Prevention says 53 cases have been reported and 31 people were hospitalized between March 13 and April 6, including five who developed a type of kidney failure called hemolytic uremic syndrome. No cases have been identified in Maine. Symptoms of E. coli O157:H7 infection include severe stomach cramps, diarrhea and vomiting. The CDC has warned the public not to eat any chopped romaine or salads and salad mixes containing romaine. On Friday, that warning was expanded to include any romaine lettuce, including whole heads and hearts of romaine lettuce, unless it can be confirmed it is not from the Yuma, Arizona, growing region. The agency also advised consumers to throw away any store-bought romaine they have at home. Sarah Wallace, a software industry analyst from Yarmouth, took the new warning to heart and threw out a bag of hearts of romaine she purchased Sunday. “I just didn’t want to take any chance, so I threw it away,” she said. Wallace had been buying salad mixes and chopped romaine to feed her two children, ages 11 and 15, who won’t eat a lot of vegetables but do like salads. She stopped buying those products over the winter, after the first CDC warning came out. After last week’s warning, she tossed the salad altogether and switched to steamed green beans. Hannaford spokesman Eric Blom said the store has worked with its suppliers to verify that all romaine lettuce products now available in its stores were not produced in the Yuma area. Hannaford now carries only romaine that has been grown in California and Florida, he said. Customers who may have purchased romaine previously and still have it at home can return it to the store for a full refund, he said. Teresa Edington, spokeswoman for Shaw’s, said Shaw’s stores have removed bagged salads and other products containing chopped romaine lettuce grown from the Yuma region and changed its supplier for those products. Shaw’s also is offering refunds. Both grocery store chains have put up signs to let customers know the romaine in the stores is not affected by the scare. Restaurants are responding to their customers’ skittishness by making simple changes. Jimmy Liang, owner of Big Fin Poke restaurants in Westbrook and South Portland, said he had been using both romaine and spring mix in his salad bowls. Although his suppliers both told him their romaine is sourced in California, he decided to replace it with more spring mix “for safety reasons.” He hasn’t decided yet whether he will add romaine back to the salad bowl once the outbreak is over. 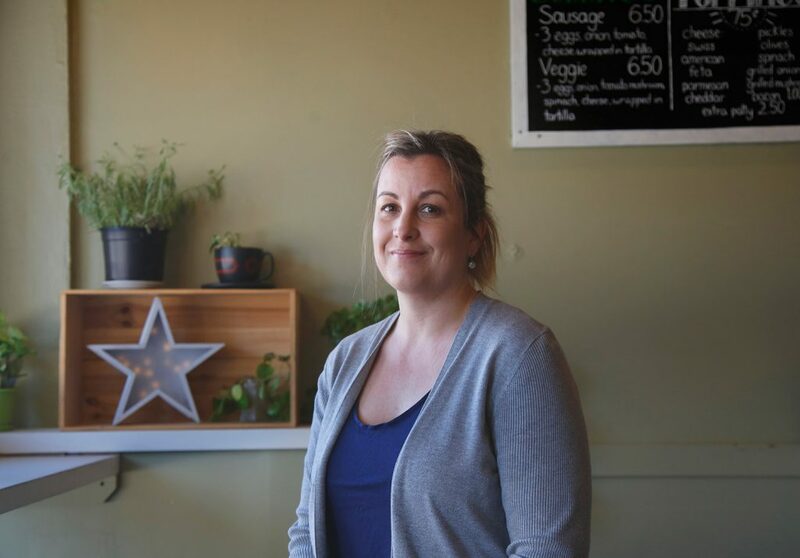 At One Six Green, a new cafe in Portland’s Monument Square, owner Kharis Johnston is now making Caesar salads with a variety of green leaf lettuce, after her suppliers couldn’t guarantee her that none of their romaine came from Arizona. She has not put up any signs notifying customers of the change, but no one has noticed or asked about it, either. “When it’s chopped up in the same fashion, it just looks like a richer version” of romaine, she said. Other restaurateurs have taken the opportunity to switch suppliers so their lettuce is locally sourced. The signature grilled Caesar salad at Five Fifty-Five in Portland is now made with hydroponic romaine grown by Spring Works Organics in Lisbon. Chef de cuisine Kyle Robinson said the switch was made a couple of months ago, and he loves the product. Trevor Kenkel, owner of Spring Works, said he has seen some uptick in demand for his romaine, which accounts for about 20 percent of what the company grows, “but we’re limited in how much we can produce.” Spring Works supplies romaine to Walter’s restaurant in Portland, as well as Bow Street Market, the Portland Food Co-op and 20 Hannaford stores in Maine. Kenkel noted that the winter production in Yuma County, Arizona, represents more than 90 percent of the leafy greens grown in the United States from November through March.